The current fiscal framework of the EU is insufficiently transparent and highly complex. There are many different rules in place at the national and supranational level, and affairs are made even more intricate by a multiplicity of exceptions and escape clauses. Consequently, the rules are not sufficiently effective in confining the deficit bias of governments and ensuring sustainable public finances. This should not be mistaken, however, as an inherent weakness of pursuing a rules-based approach. It is rather the result of its poor implementation. Yet, already a limited reform of the European fiscal framework would help to alleviate these problems, neither a repeal nor a radical reform of the framework would be necessary. The German Council of Economic Experts (GCEE) has repeatedly pointed out the need for a reform of the fiscal framework and outlined the framework guiding this column in its latest annual report (GCEE 2017). The call for reform of the current framework is shared by a broad range of academics and institutions, including the European Commission (2017), the IMF (Eyraud et al. 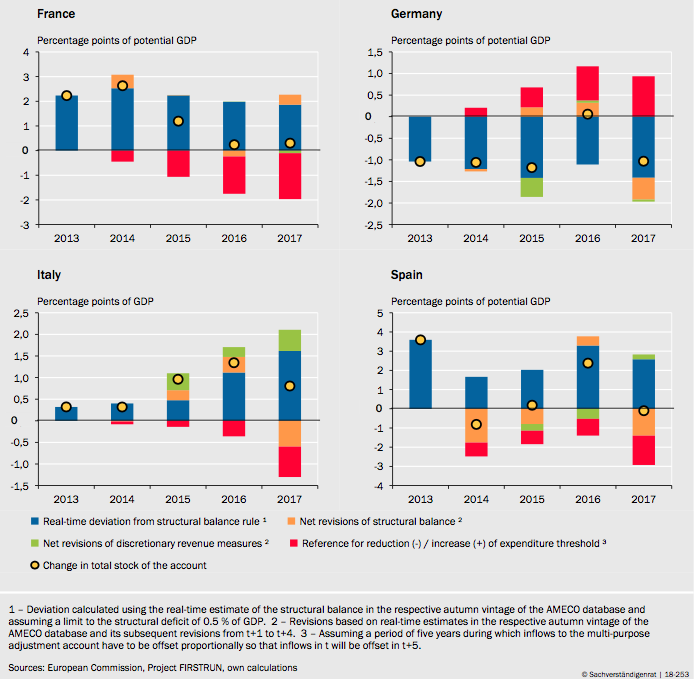 2018), the European Fiscal Board (2017) and the French Council of Economic Analysis (Darvas et al., 2018). However, no consensus has emerged to date on a concrete redesign of the European fiscal framework. In the view of the GCEE, the most recent reforms of the Stability and Growth Pact have been moving in the right direction, most prominently through the ‘six-pack’ and ‘two-pack’ regulations, and the Fiscal Compact (GCEE 2015, Feld et al. 2016). Yet, neither these reforms nor subsequent interpretations by the European Commission and the Council of the EU have led to an increase in compliance or a stricter enforcement of the rules. Rather, they have come at the expense of increased complexity and practical implementation problems. In this column, we outline a possible redesign of the fiscal framework, addressing the shortcomings of previous reforms and the need to enforce the current framework. The background paper by Christofzik et al. (2018) provides additional analyses and technical details for the addressed shortcomings of the existing and the design of the proposed framework. 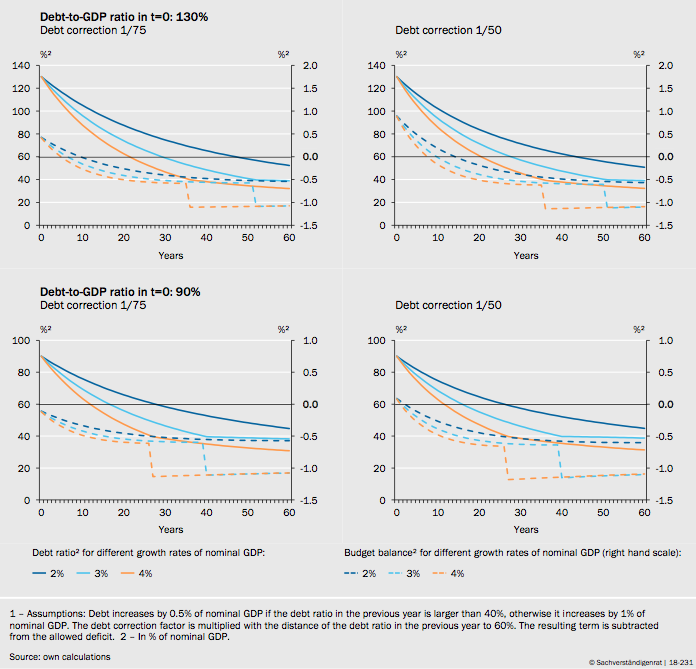 The refocused framework (as depicted in Figure 1) builds on the premise that to ensure fiscal sustainability, while sovereignty in fiscal policy remains with member states’ governments, it is necessary that levels of public debt do not exceed some threshold. While its precise magnitude remains obscure, our proposal usesa long-term debt limit as an approximation, such as the 60% threshold in the Stability and Growth Pact. In contrast to other proposals (Andrle et al. 2015, Claeys et al. 2016, Benassy-Quéré et al. 2018; Darvas et al. 2018), it also retains as a key element the structural balanced budget ruleas stated in the Fiscal Compact. The general government budget should be close to balance over the business cycle. This is considered to be the case if the structural deficit does not exceed 0.5 % of GDP, or 1% of GDP if the debt ratio is significantly below 60%, and if risks to long-term fiscal sustainability are low. Since methods of cyclical adjustment are highly prone to error in real time but more reliable in the medium term, the proposal regards compliance with the structural balance rule as a medium-term target. For monitoring purposes, the long-term debt rule and the medium-term structural balance rule need to be operationalised at the annual level. Our proposal works with an expenditure rule in the form of an annual ceiling (Figure 2). While other proposals are also based on an expenditure benchmark, they usually abandon one or both of the other rules. Instead, we establish the link to the long-term debt limit via a debt-correction factor that ensures a reduction of the current debt ratio towards the long-term threshold. Moreover, we specify a multi-purpose adjustment account, which ensures compliance with the structural deficit rule in the medium term by capturing deviations from the rule, with the requirement to offset them within a certain period of time. This proposal might not require a complete overhaul of the European framework and treaties, and would therefore be easier to put into practice than other proposals. Moreover, it would simplify the public debate about the adherence to fiscal rules, as the focus would be shifted towards the easy-to-grasp expenditure rule and the adjustment account, while drastically reducing exceptions and escape clauses. Another, quite similar expenditure rule is already part of the current framework of the SGP, but receives much lower public attention. Furthermore, the framework would be consistent with the existing national rules introduced in the member states owing to their participation in the Fiscal Compact. Our proposal contains several additional simplifying elements aimed at increasing both transparency and the political costs of non-compliance. At present, the debt ceiling and the (structural) balanced budget rules are at the centre of public perception and debate. However, ex-ante compliance with these rules is difficult to ensure. Parts of the variables constrained by the balanced budget rule are not under the government’s direct control. They cannot be forecast reliably, as revenues and thus public deficits are highly dependent on the state of the business cycle. This applies even more to those cyclically adjusted measures involving cumbersome estimates, such as the structural deficit. Their estimates suffer from large margins of error, especially in real time and in forecasts. By contrast, government expenditures can be directly influenced by governments; they are largely independent of the business cycle, and forecast errors are relatively smaller (Christofzik et al. 2018). Expenditures on unemployment is the only spending category that deviates from this pattern; its cyclical component should therefore be subtracted. As interest payments are not under the direct control of the government, they should be subtracted as well. A well-calibrated fiscal rule, however, that is complied with and thereby induces a reduction in the debt-to-GDP ratio will automatically put interest expenditures on a downward path as well. In consequence, the operational fiscal rule which is the key element of our refocused European fiscal framework could build on the existing expenditure rule. That rule would only require some minor, albeit indispensable modifications, particularly relating to exceptions and escape clauses. Furthermore, formal links need to be established to the debt level and the structural deficit rule. The proposal incorporates both aspects through a debt-correction factor and a new multi-purpose adjustment account. This account would collect the deviations of all government expenditures from the forecasts made during the budgetary process. The government would be required to offset these deviations within a certain period of time; the same would apply to deviations from the structural deficit rule. While other proposals, such as Claeys et al. (2016) or Bénassy-Quéré et al. (2018), also include an adjustment account, it has less scope and is used to offset small deviations between actual and budgeted public expenditures. Specifying a well-founded rule is one thing, ascertaining its credibility in the vicissitudes of practical policy implementation is quite another. A fundamental prerequisite for credibility is that assessments regarding compliance remain consistent over the course of time. In the current framework, this assessment often changes when the perspective changes from real-time data to ex-post data. This phenomenon reflects its reliance on output-gap estimates. They are indispensable for calculating the structural deficit, but unfortunately they are typically prone to large revisions as better data become available. Consequently, assessments based on the concept of the aggregate output-gap can lead to significant policy errors. By contrast, revisions of public expenditures tend to be considerably smaller (Andrle et al. 2015). It is therefore highly sensible to concentrate on expenditures for monitoring purposes. A major drawback of the original rules in the Maastricht Treaty, such as the 3% deficit rule, is their procyclical nature. Originally, this was not a major issue, as the original intention of these rules was to pre-specify concrete numerical limits for exceptional times that might or might not arise eventually. In practice, however, these limits mutated into regular benchmarks to be utilised in good as well as in bad times (Reuter 2015). As governments typically exhaust the limits in normal times, in bad times they don’t have any leeway to manoeuvre within the limits. In effect, the rules exhibit procyclical effects. The original deficit procedures already address this problem by the introduction of the structural deficit rule, at the expense of the necessity to use failure-prone output-gap estimates. Our procedure is avoiding procyclicality more directly. Primary government expenditures net of cyclical unemployment payments are largely acyclical anyway, i.e. they hardly change systematically with the business cycle (Christofzik et al. 2018, Mourre et al. 2013). Yet, while discretionary fiscal policy is often unsuitable for counteracting regular cyclical fluctuations (Elstner et al., 2016), automatic stabilisers should be able to react as freely as possible. This can be guaranteed by specifying the expenditure rule to exclude cyclical unemployment expenditures. Residual expenditures should be included, though, as they are largely free of automatic stabilisers. Thus, constraining expenditures leads to a rule design that is much less procyclical than the original 3% rule and restricts automatic stabilisers even less than the structural balance rule. The main focus of the current fiscal framework, and especially its reforms after the Great Recession, lies on the structural deficit rule. It has been introduced in national legislation throughout the EU member states in the context of the inter-governmental Fiscal Compact. The rule has a clear theoretical rationale. The key idea is that public finances should be close to balance over the cycle. Yet, it is admittedly difficult to implement in year-by-year monitoring due to complexities in measurement. Nevertheless, the structural balance rule remains important as a medium-term benchmark. This would serve several objectives. Retaining the structural deficit rule in the medium term corresponds to the spirit of regulations at the national (Fiscal Compact) and supranational (SGP) levels. In addition, there are circumstances in which augmenting an expenditure rule just by a mechanism for debt correction would not be enough to ensure a close-to-balanced budget over the cycle. For example, if an economy exhibits a positive output gap and its expenditure growth is below the ceiling, then its debt-to-GDP ratio is decreasing, but it does not need to have a positive structural balance. Estimation errors of the structural balance are most severe in real time. Immediately after the first two years following a specific year, the revisions are already substantially smaller (Christofzik et al. 2018). The current European framework implemented a complicated system of adjustments to the excessive deficit procedure– so-called alpha- and beta-corrections – in an attempt to take this into account. This has increased the complexity of an already cumbersome system even more. The European Commission’s Vade Mecum, the official handbook on the European fiscal framework, needs more than 200 pages to explain the calculations employed to determine whether a country is complying with the rules (European Commission 2018). A multi-purpose adjustment account could be used to circumvent this problem, while retaining the structural balance rule as the benchmark in the medium term. Any deviation from the rule would be captured in this account and earmarked separately for compensation over the course of the subsequent years. In subsequent years, revisions of past structural balances (that could have a positive or negative effect) would also be captured and might offset past deviations. This procedure would substantially mitigate the impact of real-time estimation errors, retain a balanced budget over the cycle as the medium-term benchmark and make the relevant calculations more transparent. Net inflows to the adjustment account would have to be balanced over the medium term (e.g. five to ten years), setting a natural cap to the annual size of the adjustments. One could also limit positive additions in exceptionally good years to mirror the escape clause for exceptionally bad years. As long as member states do not shift budgetary sovereignty to the European level, the size of the public sector – i.e. the ratio of public expenditures to GDP – should be the decision of national electorates. However, in order to allow for this flexibility within expenditure rules, additional expenditures need to be financed by additional revenues. The latter has to be estimated to determine compliance with fiscal rules. As can be observed in the current European framework, these estimates are prone to considerable uncertainty. In our proposal, maintaining the structural deficit rule addresses the problem as revenue developments are considered over the medium term. Furthermore, the realisation of discretionary revenue measures could be tracked and previous estimates revised accordingly. These revisions would then also be collected in the multi-purpose adjustment account. Figure 3 provides an example documenting the records in the multi-purpose adjustment account for four EMU countries from 2013 to 2017. Details regarding these calculations are provided in Christofzik et al. (2018). The account would collect four elements: i) violations of the structural balance rule based on real-time estimates (blue bars), ii) revisions of these estimates for previous years (orange bars), iii) revisions of the estimated revenue impact of discretionary tax measures (green bars), and iv) short-term deviations between actual and budgeted expenditures which occur during the budgetary process and are typically small (not shown in the figure). Each year a fraction of past changes to the adjustment account, which could also be positive, would be offset: the benchmark specified in the expenditure rule would be adjusted in reaction to the net entries to the adjustment account which occurred during the previous five years (Figure 1). In Figure 3, the simplifying assumption is that net inflows of one year would be reduced proportionally in each of the subsequent five years (red bars). The example shows that France had a structural deficit larger than the threshold in all five years and thus a positive addition to the adjustment account (blue bars). Germany, on the other hand, had a structural deficit lower than the threshold, which leads to negative additions. In both countries, revisions of structural balances in previous years (orange bars) would have altered the adjustment account in various years. These revisions can be quite substantial. An example is Spain in 2014, where the revisions of past structural balances are larger in total than the real-time violation of the structural balance rule in this year. Every country in our example experienced some revision of estimates of discretionary revenue measures (green bars). In this example, a fifth of the net inflow to the adjustment account needs to be offset in each of the five following years. The red bars show the respective sum for a specific year. This value is the basis for the correction of the benchmark of the annual expenditure rule. Fiscal rules are generally introduced to confine the deficit bias of politicians and governments and ensure the sustainability of public finances. The latter can be secured by keeping the debt-to-GDP level below a certain threshold (e.g. 60% of GDP in the Stability and Growth Pact), or at least putting it on a path towards this threshold. To operationalise this long-term limit, the expenditure rule could entail a markdown relative to the difference between present debt levels and the long-term limit. This also forms part of various other proposals (Andrle et al. 2015, Benassy-Quéré et al. 2018, Claeys et al. 2016). Regarding implementation, a gradual adjustment path could be envisaged that splits the debt-reduction requirement into equally sized parts. The simulation in Figure 4 considers a symmetric debt correction of 1/75 and 1/50. This grants countries with a lower debt-to-GDP ratio additional freedom, because it would relax the structural deficit rule.However, given the current debt-to-GDP ratios, this would not apply to any country in the near future. More detail and additional scenarios are presented in Christofzik et al. (2018). The structural balance rule with a structural-deficit ceiling of 0.5% of GDP puts the debt-to-GDP ratio on a downward path during normal times. However, a debt-correction factor increases the speed of adjustment. The current rule in the Fiscal Compact sets the lowest limit for the structural deficit at 0.5% of GDP in general, and at 1% of GDP if public debt is significantly below 60% of GDP. Without a debt-correction factor, convergence below the 60% limit would take a very long time for countries with currently high levels of public debt. For example, in the case of Italy’s debt of more than 130% it would take 34 years to arrive at the 60% limit assuming a 3% growth rate of nominal GDP. With a debt correction of 1/50 and a growth rate of 3%, Italy would approach this level after 29 years. Compliance with European fiscal rules and their enforcement have been weak. A significant increase in the political costs of non-compliance is therefore key. If a violation of rules has political consequences, the effect on the behavior of politicians and compliance with fiscal rules can be expected to be much stronger than legal sanction mechanisms. But to increase the potential for consequences, voters, politicians and the media need to be able to assess government plans relative to the fiscal rule in real-time. Transparency and simplicity are therefore essential so that the rules can be binding and serve their function as an anchor for the public, the media and financial markets. By contrast, today’s rules are characterised by such extreme complexity that even experts can barely determine whether member states meet all the requirements of the fiscal rules. A simplified framework and a focus on one central rule would constitute a significant step towards more political accountability. Reducing the ever-growing number of exceptions and escape clauses in the current framework would be another. Many such exceptions and escape clauses are currently being applied (Figure 5). This is not in the spirit of the rules, increases complexity, and makes judgements on compliance subjective and non-transparent. Examples include exceptions for pension and structural reforms and various types of investment expenditures. The legal provisions for these exceptions and escape clauses have been introduced in various EU regulations over time and are detailed by the European Commission. Thus, presumably, they could also be abolished without a treaty change. An appropriately designed rule would mean that no exceptions and just two escape clauses would be necessary: one for natural disasters and one for exceptionally severe economic crises. A decision on the latter could be based on a specific set of economic indicators. Independent monitoring institutions can support this process and draw attention to worrisome developments. In particular, the national fiscal councils introduced recently have considerable potential for increasing transparency and the accountability of governments. However, the design of these councils is very heterogeneous across member states. Many of them lack essential features they need to act effectively as watchdogs. They require a minimum set of standards with respect to factual independence and their mandate. The European Fiscal Board would also need an overhaul before being entrusted with additional tasks. Its (political and factual) independence from the European Commission would have to be firmly established. Furthermore, it would need a significant increase in staff and financial resources to perform such a task independently (Asatryan et al. 2017). Giving either the national councils or the European fiscal board additional responsibility with respect to fiscal rules, as suggested for example in Bénassy-Quéréet al. (2018), could be problematic in their current state. In addition, democratic accountability plays a key role in the public acceptance of fiscal rules, which makes a complete delegation of tasks to technical experts unfeasible. However, the actions of the political body of the EU, the Council, have shown in the past that time inconsistency and peer pressure make it unreliable in the enforcement of the rules. A way out would be democratically legitimised rules with small discretionary and larger automatic parts. Thus, sanctions should be more automatic and suitable to increase political costs for governments of non-compliance with the rules. The enforcement of current sanctions is time inconsistent as they are at the discretion of the Council of the EU or a politicised European Commission. This might be one reason why there have been no sanction payments to date. The current modalities with regard to sanctions have been introduced especially in one of the six-pack regulations (Regulation (EU) No 1173/2011). A way to make sanctions more credible would be to introduce more automaticity through a new EU regulation. The size and design of sanctions could be predetermined and not set by the European Commission. This would prevent cases like Spain and Portugal in 2016, when a violation of the rules was declared but the sanctions were set to zero euros. Furthermore, the assessment about compliance and non-compliance should not be conducted by a political European Commission. Instead the European Commission could bind its assessment to the verdict of an independent fiscal council, like a reformed European Fiscal Board. The European Council would, as foreseen today, at the end still vote on the imposition of sanctions based on a reversed qualified majority. In addition to greater automaticity, various ex-ante possibilities could enhance compliance with the rules. 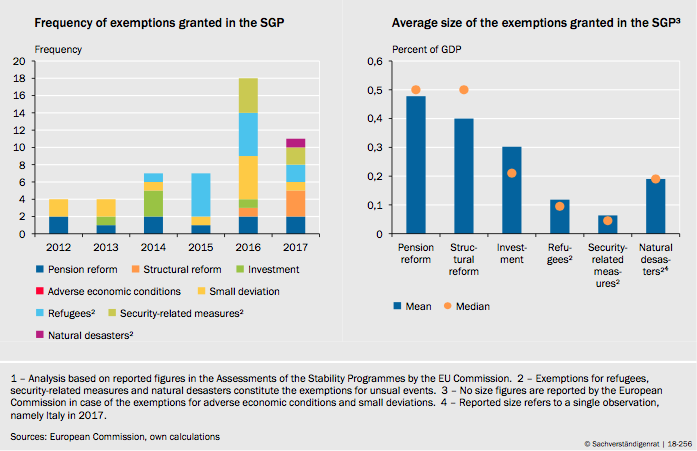 Among others, a requirement to comply with fiscal rules could be a pre-condition to gain access to a precautionary credit line of the ESM or the history of compliance with fiscal rules could be a criterion used in the evaluation of a debt restructuring mechanism of the ESM (Andritzky et al. 2018). In contrast to many other proposals, the one presented in this column does not call for a radical repeal and restructuring of the European fiscal framework. It builds on various elements that already exist today, but calls for a shift in focus and changes in implementation. This might make it easier and more realistic to realise than a complete change in design. Many procedures and specifications causing the complexity of the current system are not enshrined in the European treaties or in inter-governmental treaties, but are rather based on regulations and guidelines laid down by the European Commission or the Council of the EU. These elements could be abolished without treaty changes. The other elements, such as fiscal rules apart from the expenditure rule, would move out of focus, but in accordance with the treaties still be enforced through their link to the expenditure rule. Nevertheless, the proposal would achieve the goal of having a consistent, more transparent fiscal framework with stronger incentives for compliance that counteracts the deficit bias of governments and ensures the sustainability of public finances. Andritzky, J, D I Christofzik, L P Feld, and U Scheuering (2018), “A mechanism to regulate sovereign debt restructuring in the euro area”, International Finance, forthcoming. Andrle, M, J Bluedorn, L Eyraud, T Kinda, P K Brooks, G Schwartz, and A Weber (2015), “Reforming Fiscal Governance in the European Union”, IMF Staff Discussion Note, SDN/15/09. Asatryan, Z, X Debrun, F Heinemann, M Horvath, L Ódor und M Yeter (2017), “Making the Most of the European Fiscal Board”, ZEW policy brief No. 17-03. Bénassy-Quéré, A, M. Brunnermeier, H. Enderlein, E. Farhi, M. Fratzscher, C. Fuest, P.-O. Gourinchas, P. Martin, F. Pisani, H. Rey, I. Schnabel, N. Véron, B.Weder Di Mauro, and J. Zettelmeyer (2018), “Reconciling risk sharing with market discipline: A constructive approach to euro area reform”, CEPR Policy Insight No. 91. Christofzik, D I, L P Feld, W H Reuter, and M Yeter (2018), “Uniting European Fiscal Rules: How to Strengthen the Fiscal Framework”, German Council of Economic Experts Working Paper No. 04. Claeys, G, Z M Darvas, and A Leandro (2016), “A proposal to revive the European Fiscal Framework”, Bruegel Policy Contribution 2016/07. Darvas, Z., P. Martin and X. Ragot (2018), “European fiscal rules require a major overhaul”, Les notes du conseil d’analyse économique, no 47, September 2018. Elstner, S, H Michaelis, and C M Schmidt (2016), “Das leere Versprechen der aktiven Konjunktursteuerung. The Empty Promises of Active Economic Fine-Tuning”, Wirtschaftsdienst 96(8): 534-540. European Commission (2017), “Reflection Paper on the Deepening of the Economic and Monetary Union”, May. European Commission (2018), “Vade Mecum on the Stability and Growth Pact – 2018 Edition”, Institutional Papers 075. European Fiscal Board (EFB) (2017), 2017 Annual Report of the European Fiscal Board, November. Eyraud, L, X Debrun, A Hodge, V D Lledo and C A Pattillo (2018), “Second-Generation Fiscal Rules: Balancing Simplicity, Flexibility, and Enforceability”, IMF Staff Discussion Notes No. 18/04. Feld, L P, C M Schmidt, I Schnabel, and V Wieland (2016), “Completing Maastricht 2.0 to safeguard the future of the Eurozone”, VoxEU, 23 March. German Council of Economic Experts (GCEE) (2015), Consequences of the Greek crisis for a more stable euro area, Special Report, July. German Council of Economic Experts (GCEE) (2017), Towards a Forward-Looking Economic Policy, Annual Report, November. Mourre, G, G-M Isbasoiu, D Paternoster, and M Salto (2013), “The cyclically-adjusted budget balance used in the EU fiscal framework: an update”, European Commission - European Economy, Economic Papers 478, March 2013. Reuter, W H (2015), “National numerical fiscal rules: Not complied with, but still effective?”, European Journal of Political Economy 39(C): 67-81.